Immune system. 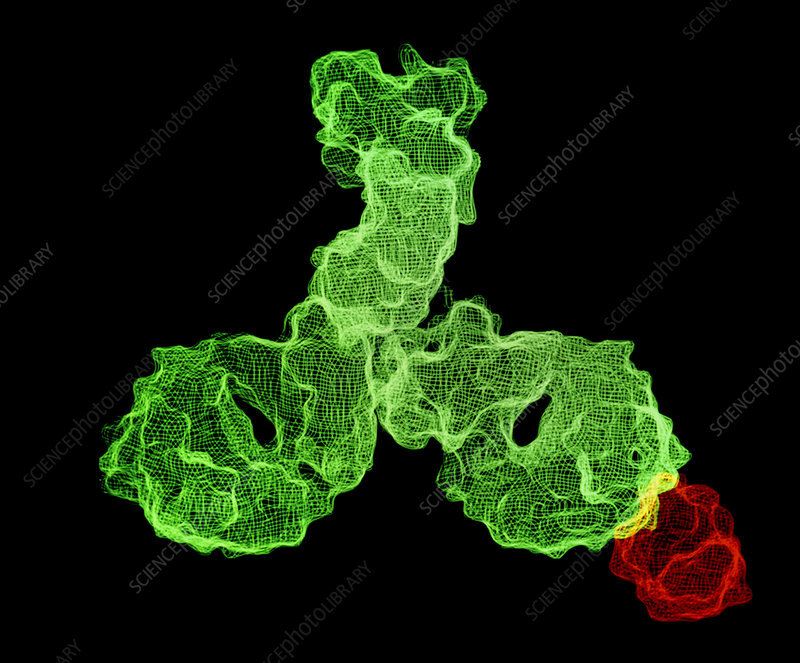 Computer graphics representation of a whole Immunoglobulin G (IgG) molecule (green) bound to an antigen (hen egg white lysozyme, in red). IgG is one of a group of related proteins that act as antibodies in the blood. IgG is composed of a vertical fragment (denoted Fc) and two fragments that form oblique branches (denoted Fab). Antigen-antibody interaction occurs at the tips of these Fab branches. Antibodies are synthesised in lymphoid tissue in response to the presence of a particular antigen & circulated in the blood plasma to the troubled site. The body makes a huge range of antibodies, each with a slightly different structure.